This large-scale processional performance inspired by the centenary of the Representation of the People Act celebrates local and global stories of women and their continuing struggle for equality and human rights. A giant woman puppet arrives in Woolwich, accompanied by the beautiful spirit of the Bird of Freedom, representing an eternal dream of equality. She has travelled a long way, gathering the stories of women on her journey across the world. As she explores, she learns about the dreams and struggles of some of the diverse women – past and present – who have contributed to the story of Woolwich. 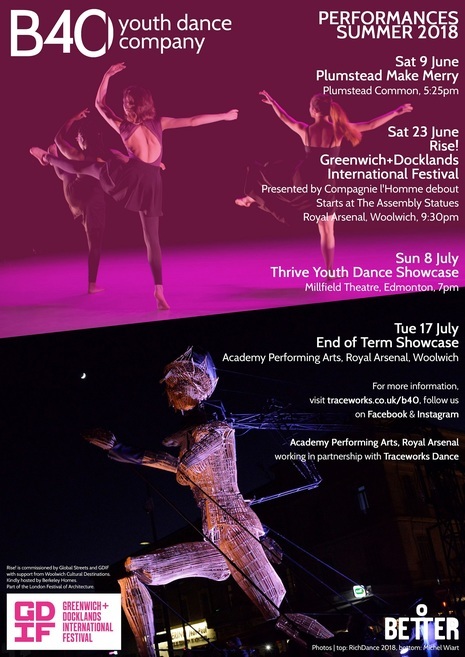 B40YDC are delighted to have been invited to join the procession and will commence the event with a performance at The Assembly Statues (Thames Path, Woolwich, London SE18). This is a free performance. Commissioned by Global Streets and GDIF with support from Woolwich Cultural Destinations. Kindly hosted by Berkeley Homes. Part of the London Festival of Architecture. Photo | Michel Wiart.